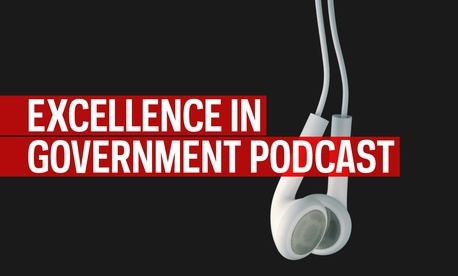 The Excellence in Government Podcast features interviews with public and private sector thought leaders to offer rising feds tips for tackling government’s most pressing management challenges. What's the key to tearing down barriers in government? The great unifier, says Justin Herman of GSA's Center for Excellence in Digital Government, is social media. In his role at the GSA Center for Excellence in Digital Government, Herman manages the Federal Social Media Community of Practice. This group unites more than 300 social media practitioners in government across nearly 100 agencies. "Traditionally in any organization you have silos that get created...we wanted to create a community where we had everyone at the table," said Herman, who was recently a guest on the Excellence in Government Podcast . "Once you unlock these (social) data sources...it becomes an integration of services where it's less based on bureaucratic silos and technology silos and it becomes more about getting you the services you need where you are." And social media's role in managing performance and empowering federal employees to do more. Follow Justin Herman's work at howto.gov and on Twitter ( @justinherman ). Listen to the Excellence in Government Podcast . Previous Post | Analysis: What Will Furloughs Mean For Young Feds?